If you must know, they are Dr. Martens. 1. Karen has new shoes. 3. 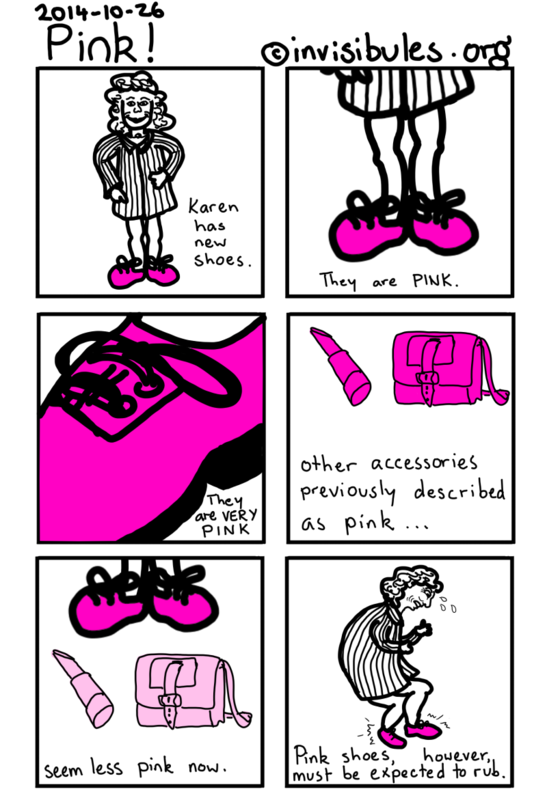 They are VERY PINK. 5. ... seem less pink now. 6. Pink shoes, however, must be expected to rub. Use the rounded end of the head of a hammer on the inside of the back of the heel of the shoe to soften it just a little. Wet the inside of the shoe, and wearing 2 pr of socks, wear the shoe ’til it’s dry. Instant (almost) breaking-in! Thanks jkh, I’ll try that. My feet have just about recovered from their ordeal in PINK.